Sam and Dave from Hot 91 with Peregian nippers. 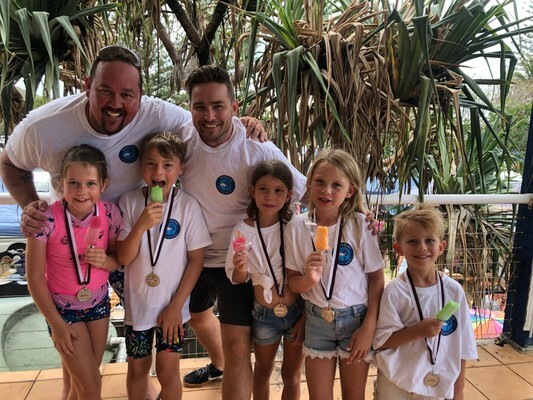 Over 400 nippers turned out recently to celebrate the end of a fantastic season of junior surf lifesaving with the presentation of the Noosa and Peregian Nippers Awards. This follows on the back of the end-of-season party where Sandy Bolton, MP presented awards, along with Hot 91 celebrating a fantastic return season for Peregian Surf Life Saving. 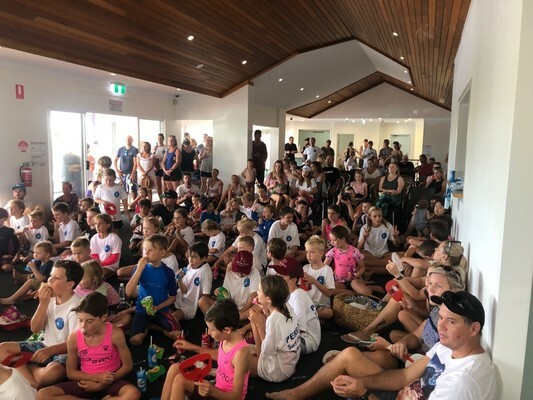 The Awards event was held upstairs in the Peregian Surf Club and was attended by Cr Ingrid Jackson, NHSLSC president Ross Fisher, life members, members of the NHSLSC management, and junior activities committee members for both Noosa and Peregian Nippers. Junior Activities Coordinator of Peregian Nippers Lyndon Forlonge said the throng of nippers were eager to find out if they had won the most improved or ‘Essence of Nippers’ trophies for their respected age groups, as well as age champion coaching awards. “It was fantastic to see families enjoying a relaxing meal, while the nippers burnt off excess energy on the giant inflatable obstacle course,” Lyndon said. The junior activities committee members were congratulated on their tireless efforts this season in providing the program for nearly 800 children across the two beaches, with special mention to Peregian nippers for what has been hailed a massive success with over 110 children attending Peregian each Sunday. “We have been reflecting on what has been another wonderful season at both Noosa and Peregian, and our attention has now turned to next season with pre-planning in the pipeline,” Lyndon said.